Miguel Madaleno, born in 1983, natural of Montemor-o-Novo, soon moved to Pinhal Novo, Palmela. Since 2006 is the Conductor of the Orchestra "Orquestra Nova de Guitarras", musical project that has created and developed with distinction. With his training in Higher Management Course in Huelva Orchestra and Band, under the direction of Conductor Navarro Lara, has been developing his skills markedly. Miguel Madaleno was invited to conduct orchestras in cultural and musical events. He began his musical studies at the age of 9 in Guitar , with the Professor Mário Martins. With 11 years old began studying trumpet, an instrument that had some weight in his musical progression but eventually the guitar was the instrument of choice in the natural professional career. 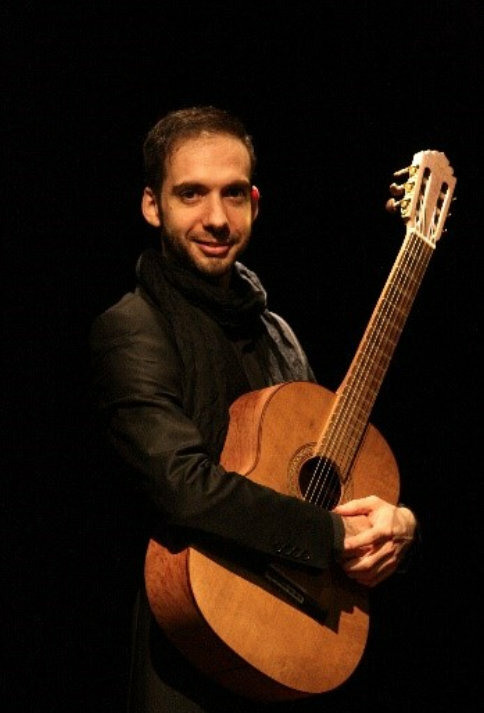 Since 2002 he is Professor of Guitar in your project "Classe de Guitarra" and has promoted the election of some students in the ingression of Orquestra Nova de Guitarras. Miguel Madaleno got training in Music Pedagogy under the guidance of Professor Jos Wuytack and a Bachelor Degree in Music at the Community in School of Education and School of Music in Lisbon. Since 2004 he is Professor of Initiation, Expression and Musical Education in several schools promoting the importance of music and their learning. Mentor and collaborator in various musical projects, has established a connection not only with musicians but also with the community which highlights the influence and importance of Classe de Guitarra- School of Music | Orquestra Nova de Guitarras. The characteristic kindness, humility commitment and dedication of Maestro is an asset in the growth of the Orquestra Nova the Guitarras and career growth of Miguel Madaleno. Currently has reserved some attention as a composer for Orchestra and for his instrument, the guitar. In January of 2013 he embraced a new project, the result of his training and passion, while Orquestra Philarmónica de Lisboa Maestro.